Former Brazilian President Luiz Inacio Lula da Silva speaks during a press conference at the headquarters of the Workers' Party in Sao Paulo, Brazil, July 13, 2017. Luiz Inacio Lula da Silva said on Thursday that he still intended to run for president in the 2018 elections. Rahel Patrasso/Xinhua News Agency/PA Images. All rights reserved. Did you, too, O friend, suppose democracy was only for elections, for politics, and for a party name? I say democracy is only of use there that it may pass on and come to its flower and fruit in manners, in the highest forms of interaction between people, and their beliefs - in religion, literature, colleges and schools- democracy in all public and private life. Luiz Inácio Lula da Silva, Brazil´s President from January 2003 to January 2011, was found guilty on July 12 of corruption and money laundering. This is yet another episode of the political earthquake afflicting Brazil, which started in March in 2014, continued during the Olympic Games and peaked with Dilma Rousseff´s impeachment. Brazilians are becoming accustomed to seeing their presidents in legal trouble. Michel Temer, the current President, was formally accused last month of accepting bribes, becoming Brazil´s first sitting head of state to be charged with corruption. But he is by no means alone. Eduardo Cunha, the former house speaker, who happens to be a member of Temer´s party, is currently serving a fifteen-year sentence, while eight cabinet ministers and thirty-nine lawmakers in the lower house are being investigated – including the President´s chief of staff and Foreign Affairs Minister Aloysio Nunes Ferreira and the Senate President, Eunicio Oliveira. 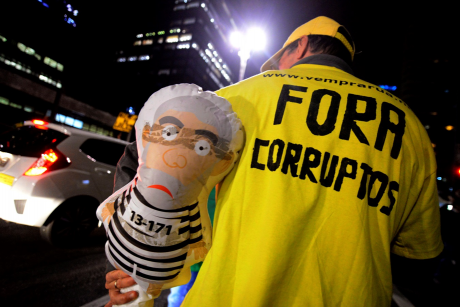 Brazilians are becoming accustomed to seeing their presidents in legal trouble. It was in this highly judicialized political environment – nearly a third of Temer´s cabinet and a third of the Senate are currently under investigation – that Sergio Moro, a federal judge, issued a first instance judgement sentencing Lula da Silva to nine and a half years in prison, adding up to the comprehensive corruption investigation into Petrobras, the state-owned oil company. The money laundering corruption scheme, known as the Lava-Jato (Car Wash) scandal, was uncovered fortuitously in March 2014, while the Federal Police was carrying out an inspection in a gas station. What started as an isolated case ended up involving politicians, authorities and businessmen in what has since then surfaced as the greatest corruption scandal in the country´s history. According to the prosecutors, construction companies such as Odebrecht and Camargo Correa established a cartel to share between them 1 and 3% of the value of the billion dollar contracts acquired from Petrobras, concealed as consultant payments through shell companies. Former President Lula da Silva – one of the most popular politicians in Brazil, who had a 90% approval rating upon leaving office –, a founding member of the Worker´s Party (PT), has been accused of receiving a bribe from a construction company by the name of OAS. According to Judge Moro, OAS bribed Lula to help them acquire contracts from Petrobras. The bribe - an estimated in 1.1. million dollars - was allegedly used to renovate a triplex apartment in the coastline town of Guarujá, near Sao Paulo. Lula also faces money laundering, corruption and obstruction of justice charges in four additional court cases, but Judge Moro did not order his immediate arrest. According to him, arresting a former President is a “serious matter” and Lula should be allowed to appeal. This sentence is certainly a historical one: this is the first time a Brazilian President is sentenced on corruption charges since democracy was reinstated in Brazil. 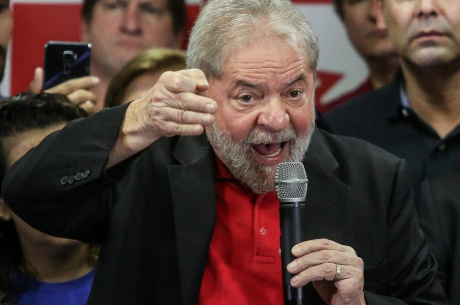 But its implications do not end here: Lula da Silva is leading the polls for next year’s Presidential election (30%), ahead of the far-right candidate, Jair Bolsonaro (16%), and Marina Silva (15%), the Sustainability Network candidate; however, if the appeal court – the Regional Federal Court – upholds the conviction, Lula will be barred from running for office. The three-judge court is expected to decide the case before August 15, 2018, the deadline for the candidates to register. This is the first time a Brazilian President is sentenced on corruption charges since democracy was reinstated in Brazil. Lula da Silva did not take the news of his conviction silently. Standing before a crowd of supporters a day after the sentence was published, he claimed he was the victim of a political trial. This is not surprising, considering that the crusade against corruption in Brazil – which has affected every significant political force in the country – is tearing down an established political culture of institutionalized practices and challenging the untouchable status of elected officials. This being so, politicians from all sides are trying to discredit judges and delegitimize prosecutors, in a desperate attempt to save themselves and their future political career. From Michel Temer to Lula da Silva – who are, of course, fierce rivals – the argument is the same: the judiciary is politically motivated and is operating beyond its constitutional assignments. This argument, however, has been de-contextualized. As trust in politicians reaches an all-time low in Brazil, prosecutors and judges have been campaigning for transparency and against corruption and, in doing so, they have received the support of Brazilian citizens: 96% of them want the Lava-Jato investigation to “go all the way, regardless of the outcome”. Brazilians have had enough of a highly fractured party system, where back-room alliances and secret agreements are the norm, and corruption widespread. Many have placed their trust in judges and prosecutors, who now have support bases and Facebook pages. People celebrate in Sao Paulo, Brazil, July 12, 2017, after Brazil's former president Luiz Inacio Lula da Silva was sentenced to nearly 10 years in prison for graft. NurPhoto/SIPA USA/PA Images. All rights reserved. One of these “liked” judges is Sergio Moro. A controversial figure, he is considered a champion against corruption by about 50% of the people. The other 50% thinks that he is apportioning powers he does not have. And that he is targeting Lula to stop him from running again for President in 2018. Indeed, while defendants currently being prosecuted come from every significant political party, the timing and the consequences of the sentence on Lula is dubious at best. Temer is an unelected figurehead President – with a 7% approval rating – who is expected to leave office soon. He has carried out a counter-reform program aimed at undoing most of what the previous PT governments had done, and now he is simply holding the baton for the next like-minded candidate to take over and further this program. Lula´s emergence would definitely endanger this alleged plan of his – so, it is easy to understand why many connect the dots. Politicians from all sides are trying to discredit judges and delegitimize prosecutors, in a desperate attempt to save themselves and their future political career. In any case, Sergio Moro is a hero for many Brazilians, especially for Conservatives and all those who oppose Dilma and Lula. And this can be a problem, because Sergio Moro is a judge, not a politician, but he has shown himself sometimes unable to tell the difference and has made controversial “legal decisions” which he was not entitled to make. For instance: he declassified an audio recording of a conversation between former President Dilma Rousseff and Lula da Silva, which arguably contributed to Ms. Rousseff’s impeachment and ignited mass protests. The sentence against Lula da Silva is another example of his way of proceeding, and a more serious one for that matter. The sentence is everything but a sentence. It is more of an opinion piece stitching one supposition with another and ending up with the decision to convict the alleged culprit for the sake of political convenience. There is legal evidence that Lula does not in fact own or has owned in the past - directly or indirectly - the triplex apartment in question; that his wife does not and has not owned it either; that OAS was and remains its rightful owner; that Lula has not lived there or benefited in any way from it. And yet, Lula da Silva has been convicted for benefiting a company - no proof of this - in exchange for an apartment that is not - formally or informally - his and for laundering money that there is no proof that it ever existed. Sergio Moro is a judge, not a politician, but he has shown himself sometimes unable to tell the difference and has made controversial “legal decisions”. By the end of the sentence you start questioning Judge Moro´s intentions and his commitment to justice and to justice alone. A judge with a political agenda is a dangerous combination and sustaining speculations only discredits the law he is supposed to uphold. Moreover, this does not further transparency in the least – it is actually hindering it. Political turmoil has become the new normal in Brazil. After Dilma Rousseff’s impeachment and Michel Temer being accused of corruption, Lula da Silva´s conviction is yet another test for the country´s fragile democracy. Once an example for the world and for Latin America, Brazil is currently going through a serious economic crisis and even a more serious institutional crisis. It is a crisis that goes beyond politics and business and that has permeated all hierarchies of power. To make things worse, the mainstream media are neither impartial nor independent. They favour a particular agenda and they have stopped pretending they don’t. Globo, Brazil’s main TV network, is a perfect example of this, as shown, for instance, with its campaign against Dilma Rousseff. In Brazil’s media context, truth does not matter and the media coverages clearly favour those campaigning for a more unequal and unfair Brazil, where the interest of the very few outplays the interests of the many. To make things worse, the mainstream media are neither impartial nor independent. Lula da Silva said in 1988 that, in Brazil, “a poor man goes to jail when he steals, but when a rich man steals, he becomes a minister.” Those words may have come to haunt him. He may be innocent or guilty - we do not know. But the man who took 20 million people out of poverty, who shaped modern day Brazil, and served as its President for two terms cannot be showing now contempt for the judiciary and say, as he does, that “if they think that with this sentence they will take me out of the game, let them know that I’m in the game”. For it is the future of the fifth most populous democracy in the world that is at stake. Sergio Moro invoked, after sentencing Lula, Thomas Fuller´s famous quote: “be you ever so high, the law is above you”. And he is right: Lula should not be given special treatment for being a former President. But he should be given the treatment every citizen has the right to and be judged according to the law, not according to political interests. And Sergio Moro should keep this in mind. This is not a contest between ideological categories, nor is it about taking sides. It is about determining what will come out of this crisis. If Lula is guilty, he should of course be condemned. If Sergio Moro is wrong, the appeal court should solve the case in Lula´s favour. The fight against impunity should not impinge on a just, factual, impartial trial, in the same way as the reputation of the accused should not impinge on the fight against corruption. This is not a contest between ideological categories, nor is it about taking sides. It is about determining what will come out of this crisis. The future of democracy in Brazil is in danger, for the rule of law is being imperilled. The media are biased. State-owned companies and big corporations are infected with corruption, and so are both houses of Parliament. An illegitimate President rules the country. And the people’s polarization is growing while Jair Bolsonaro, the far-right likely candidate for the presidential elections next year represents a very serious threat to civil rights and freedom. Brazil´s crisis requires a reinvention of its way of doing politics. Corruption is a serious issue, but the problems do not end with the elites, the dominant parties and big business. An independent judiciary is just as important. The more anonymous the judges are, the better it is for the country. Next year’s elections are an opportunity for a new beginning. But for that to happen, Brazilians must be able to look beyond their differences, beyond the good and the bad, beyond the politicians and the judges, and take a look at themselves.